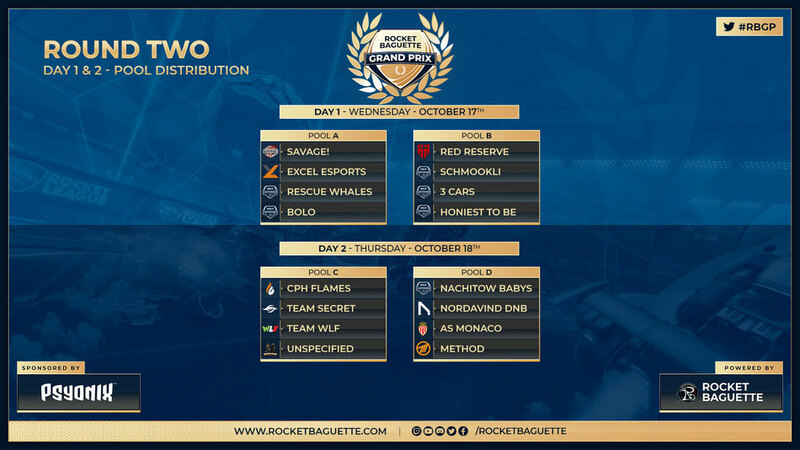 Over the last two days, the 32 teams of the first round of the Rocket Baguette Grand Prix battled to clinch their spot into the Round Two, treating us with numerous Game Five's that you might have been able to watch in English with Rewind Gaming or in French at the Rocket Baguette Twitch channel. While most Rival Series succeeded through their upper brackets, a few upsets occured, coming from Spain and Norway: Nachitow and his babies managed to send 3 cars (2/3 of The Clappers) into the lower bracket, and Schmookli swept Method in their pool's upper finals. What awaits in Round Two? 16 teams are now remaining, and we keep going on with pools of 4 teams. Each Round Two pool is composed of two Round One winners and two runner-ups. Again, a double-elimination bracket will be played in each pool and the top 2 teams will move on to the RBGP playoffs. Pools A and B will play on Wednesday, October 17h, while pools C and D will play the day after, starting again at 8 pm CEST. Rewind Gaming and Rocket Baguette will be broadcasting Round Two at 8 pm CEST next wednesday and thursday. As for the playoffs, here is how the final single-elimination bracket (all BO7 except the 3rd place match) will look like. What about Renegade Cup points? As for the 16 defeated teams this week, the RBGP experience is not over this month. In order to provide the most precise ranking of the Top 32 teams, with the objective to allocate Renegade Cup points, counting towards the next Renegade Cup monthlies and the Renegade Cup Finals, BO3 single-elimination placement brackets will be played next Wednesday, starting 8 pm CEST.